Ghost Hunting Theories: REVIEW: Sharknado 4 Tonight on Syfy Channel! REVIEW: Sharknado 4 Tonight on Syfy Channel! I am quite honored to be on the press for NBC/Syfy and I got to preview this movie weeks ago. I will not give a thing away except to tell y'all why I love this! Ian Ziering rocked this movie - what perfect casting for the lead part! Hasselhoff was also very well cast and Gary Busey! Tara Reid! Oh my gosh! I feel like I just indulged on eating a box of Twinkies and a couple pints of beer and the calorie count was zero! Yay! Naughty fun and no guilt! I watched this movie a Sharknado virgin. I have not seen the other ones and I think this helped me to totally dive in. I was hooked from the first minute and had to pause so I could use the bathroom because the short choppy editing makes it so that in a few seconds, you might miss something freaking awesome! I know Sharknado can't live forever, but I can't helping thinking that Syfy is onto something. I'd love to see celebs from the 60s, 70s, 80s and 90s coming forward and being injected into a soap opera format that plays weekly - perhaps with an over the top para theme like Ghostbusters feel. Okay, I'm dreaming, but boy would I be freaking hooked, especially if they added some music from our times and short choppy editing with tiny scenes. In my parallel dream job universe - I'm helping develop more marketable/branding/awesome viewership all-star casts for Syfy. Anyone born in the era of "Earthquake," "Airport," and "It's a Mad, Mad, Mad, Mad World," we totally get gathering every celeb you have into one insane event! Note: If you want to do a drinking game, I suggest shots for every form of transportation they take! NEW YORK - May 4, 2016 - Today, the Fourth is definitely with you as Syfy reveals the first wave of cameos and the official movie poster for SHARKNADO: THE 4TH AWAKENS, premiering Sunday, July 31 at 8PM ET/PT. 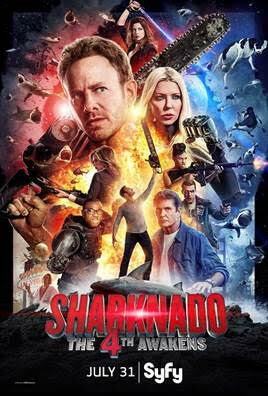 With sharknados back in full force, it’s only natural that Fin Shepard (Ian Ziering) would need to enlist help from some new friends in his tireless fight to protect the world from the sharknado menace.